Our world needs more positive things such as kindness, grace, love, encouragement. But there is also a growing fear of expressing anything that isn’t positive. In this issue, you'll learn about positivity and why we need to have a balance between true positivity and reality, and how to frame it so we are not suppressing real feelings. You'll also get to know a woman who realized that what she thought was truth turned out to be a great deception, and hear how she's spreading a new message. I want to talk about positivity and why we need to have a balance between true positivity and reality. Everywhere I look these days there is talk about positivity. Staying positive has become a hallmark of corporate circles—it's in just about every leadership, business or self-help book. Positivity is a cool thing because our world does need more positive things such as kindness, grace, love, encouragement. But there is also a growing fear of expressing anything that isn’t positive. What I think is beginning to happen is that we are encouraging people to stuff their feelings and their true situation out of fear of expressing something negative and superstitiously making bad things happen. I say this because there is also a growing sense of superstition that is hiding inside of things that look spiritual. And I am concerned. There. I said something negative. I am concerned. First, my concerns about positivity. If don’t ever acknowledge a problem, how can change or solutions ever happen? There are two ways to acknowledge a problem. One is negative, and the other is positive. But it’s important to note that the process of stating there is a problem is not negative in and of itself. Let’s take a look at a problem and see how it can be expressed both negatively and positively. The problem: I have so much to do, and I am overwhelmed. Example 1: Negatively expressing it. I have so much to do, and I am overwhelmed. I am never going to catch up. I will forever be in this condition. Nobody cares about me. I can’t fix this. Example 2: Positively expressing it. I have so much to do, and I am overwhelmed. I know I need help and there is someone out there who can help me or show me a system that will work to process through these tasks. I just need to tap into the resources I haven’t yet discovered. Do you see the shift there? One is that I have a problem and it can’t be fixed. The other is that I have a problem and I am a solution-seeker. Here is where I have struggled with this in the past and sometimes still. I try to express the problem, but to someone who believes that there is some sort of voodoo in speaking the problem aloud. Instead of being real, someone of this persuasion will ask for a restatement of the problem itself. Example: I am blessed with an abundance of things to do and I love it. But the reality is, it doesn’t yet feel like a blessing or abundance. And honestly I don’t love it yet. So what this asks is for a person to stuff his or her true feelings and essentially lie to themselves. What I propose is that we state the truth, but in a framework that we are seeking a solution and not succumbing to hopelessness. Let’s look at three ways we can make this shift happen where we can be real, but positive at the same time. Let yourself feel the feelings. Do you need to have a pity party? Give yourself a time limit on the blues, but let yourself feel something. I have tried to stuff feelings, and do you know what it leads to? All sorts of stomach troubles, disturbed sleep, physical pains, headaches. It also leads to lack of focus. The very efforts to suppress the thoughts and feelings can cause the problem to become even bigger. Don’t turn it into life-long complaining, but at least feel something. You are not a robot. Be real and know the difference between positive feelings and fake positive ones. Face reality in the framework of hope. Think of something about your current situation at home, work, socially, with a friend, a relationship. What is it that stresses you? What feeling have you wanted to stuff when you are faced with the idea that it might be a negative thought? - I know it’s a struggle to be single at Valentine’s Day, but I am going to look for ways that I can bless others who feel the same way I do today. - This cancer is making a mess of my body, and my soul feels weary. But I am going to focus on self-care this week and also ask a friend to visit me. - My business is going through a rough patch and my last marketing efforts didn’t bring any results, but I am going to press the reset and make a new plan. I’m going to do the work it takes to learn more about better strategies. Practice Discernment. There is talk everywhere of energy. Negative energy. Positive vibes. Of spiritual influences that seem religious, but are not biblical. All of these can become red flags if we aren't careful. New Age thinking and Christianity are not the same thing, even though there are messages that are similar in both. There is subtle and not-so-subtle deception in the teaching of some New Age thinkers that makes it look so spiritual. They even mention God. But their teaching focuses on becoming gods ourselves, and on the idea that you can manifest your destiny if you think enough positive thoughts to attract success. Even some churches preach a message that if you have enough faith, you can have all the money you desire, and you’ll never get sick. Discern if there is truth in these messages by comparing them with what God says in the Bible. If the message that someone is trying to give you includes no acknowledgement that there is evil in the world, it is false. We have to acknowledge both sides. If it mentions writings and manifestations without any reference to the Bible, think twice. My mission in life is to help people find joy and hope in the midst of trashy stuff. You can’t be in the middle of something trashy without knowing it’s awful. Positive thinking alone won’t make it go away. Instead, it’s when we begin to look for hope that we start to see where God is right there in the middle of it all—even the negative stuff. That’s a different message than what the positivity movement is spreading, but it’s real. Jesus didn’t think positive thoughts to get himself off the cross. He endured its pain and the agony because it was part of his mission. There is purpose in pain. And there is always hope. 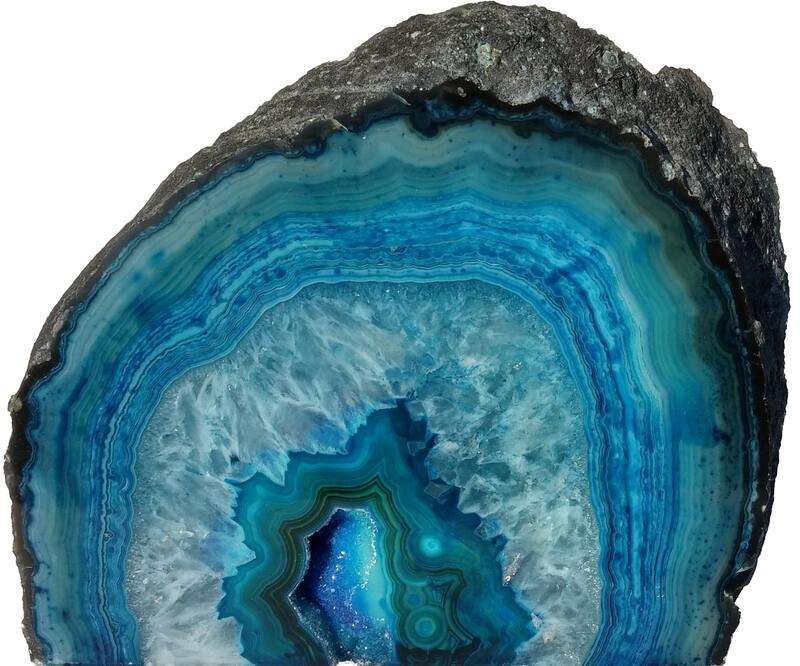 If you have ever held a geode rock, you know that you have to open it up and see what is on the inside to find the goodness. That’s what I was talking about in the first section. Don’t be afraid to really look at the ugliness in order to explore the experience of life. There is both beauty and ugliness, and together it makes reality. I have to look at my own experiences and see that even when it felt like it was falling apart, there were nuggets of beauty. It’s also why I like to look through junk at thrift sales to find items to repurpose. Somewhere under the grime and rust, there is a treasure waiting to be discovered. Doreen Virtue was once a top-selling new age author, with sold-out workshops, and a luxurious lifestyle. Then she saw a vision of Jesus on January 7, 2017, and she walked away from her career to become a follower of Jesus Christ. She faced a backlash of criticism, conspiracy theories, and persecution on social media, and lost her publisher, her Hawaiian ranch, and radio show. In her book, she discusses how her life-time of seeking happiness was finally fulfilled by the pure love that Jesus offers to us all. She talks about ways to combat spiritual warfare, how to discern whether spirits are from God or not, the scriptural teachings about angels, healing from guilt, and much more. I read her book, The Joy of Jesus, and her transformation is clear. I’m fascinated by what I have learned from her already. I’m sharing this here to encourage others to discern New Age teaching with caution. It can’t blend with Jesus. She offers an ebook version for free on her website, or it's available on Amazon in print [affiliate link*]. Doreen has left her former career and is now teaching biblical truth. She explains how she once didn’t know better, but after she read the whole Bible, she had a clear understanding of what she needed to do. She left her entire livelihood for the pursuit of truth, and has started life over. She also explains how positivity balances with the very real truth that there are evil forces at work in the word. Doreen also says, “Some people try to blend Christianity with new age, which doesn’t work. Jesus said that we can’t serve two masters (Matthew 6:24). Besides, Christianity and new age are opposites because one gives all glory to God, and the other gives all glory to yourself. Since God’s first commandment is to have no other gods before him, we break this commandment when we put ourselves on the throne of our own heart. Thank you Doreen for your vulnerability! I promised more info here than I could share on the podcast. If you'd like to know more about Doreen's transformation, this short video gives a little insight. Check out Doreen's YouTube Channel for a ton of videos about biblical truth. Posted in Articles, Faith and Inspiration.